Retractable Mini reels are compact, light-weight and a popular choice to display ID cards. 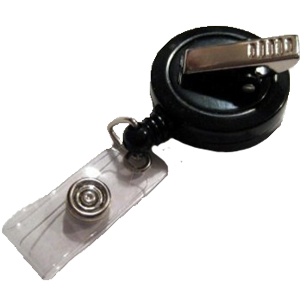 The Retractable Badge reel or “zinger” attaches to the users clothing and the user can easily pull the badge out to scan the card with the scanner without detaching the ID card. Choose from a large selection of Retractable mini reels. Mini reels for single or multiple id cards. You can personalise your retractable badge reels with your company logo. Standard or heavy duty mini reels in chrome or different colours are available. Custom designed zinger reels are available with your logo printed on them. Huge range of attachments available. Call us on 02 9651 6000 or use the enquiry form to find out more.